Well, if this isn't the eeriest looking poster I've seen in a while... But will INSIDIOUS: CHAPTER 3 actually be scarier than the first two films? Truth be told, I didn't think the first two were particularly scary as much as they were just creepy and weird. But haunted houses in general freak me out, and it's clear that this home has harvested a number of secrets that may finally come boiling to the surface in this new film -- which is actually a prequel to the series. I actually kinda like the idea of focusing on the psychic rather than the victim family this time. Watch the teaser clip below, and check Facebook tomorrow at 9am PST for a longer trailer. 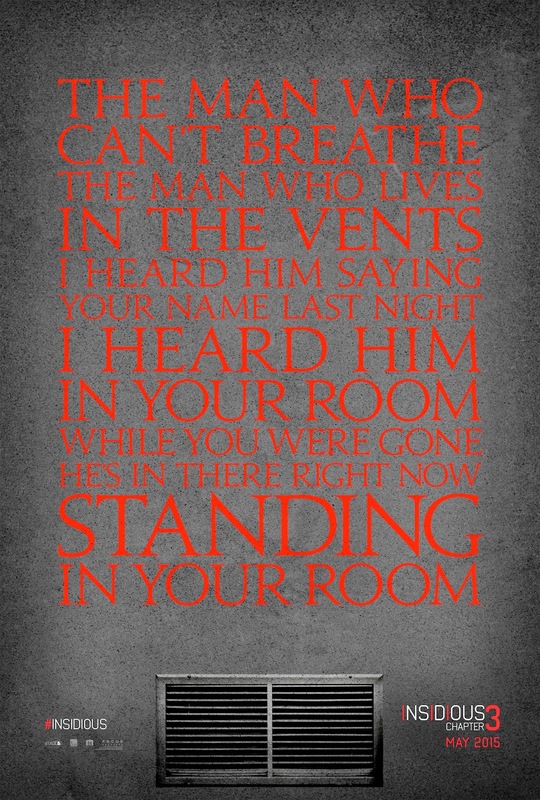 INSIDIOUS: CHAPTER 3 opens in theaters May 29, 2015. Me too! :) Hoping for more character development here. Looking forward to these, really think it' might be a fun capper to the series.